If it’s possible for any play to get audiences to sympathize with murderers “Sweeney Todd – The Demon Barber of Fleet Street” is that play. The show, with music by Stephen Sondheim, is about a barber – Sweeney Todd – who murders people. His cohort, Mrs. Lovett, then uses the remains as a special ingredient in the pies she makes. Sweeney sets up shop as a barber next to a pie store owned by Mrs. Lovett, a working-class widow. There, he begins to exact his bloody revenge. The barber is especially incensed over the fate of his teenage daughter, who was taken in by the corrupt judge who sentenced Sweeney. She has never known her father. The show is part of Suzart’s adult feature series called “After Dark”, suitable for those over 19 years. Featured in the title role is Joseph Stone and Barbara Seabright-Moore stars as Mrs. Lovett. Suzart’s recently named Artistic Director, Kraig-Paul Proulx, has dived in as director. Proulx describes Sweeney as a wronged man battling demons that threaten to consume him. Proulx has added his artistic vision to the play. The opening scene happens in current time as the actors recount the story of “Sweeney Todd”. As the story continues, they each transform into a character and become the story. 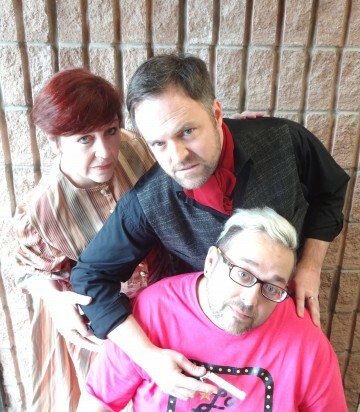 Suzart’s After Dark Production of “Sweeney Todd – The Demon Barber of Fleet Street” runs February 23 -25, 2017 at the Centrepointe Studio Theatre.